Cabinet has approved a recommendation from Minister of Social Protection Amna Ally for the regularisation of the employment of sweepers/cleaners, particularly those attached to public schools, Minister of State Joseph Harmon said yesterday. Harmon told a post-Cabinet press briefing that it is hoped that this will bring an end to “this sorry situation,” which has been affecting sweepers/cleaners for quite some time. The payment and conditions of service of sweepers and cleaners in public schools have been longstanding issues. 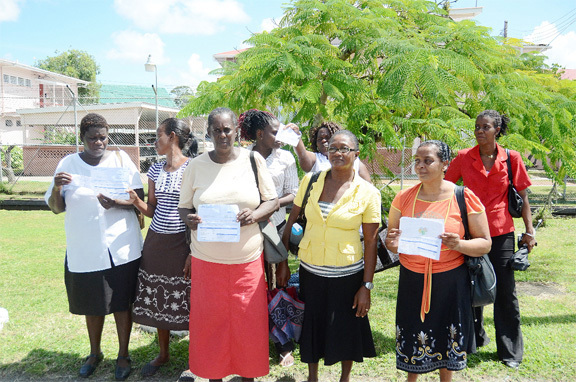 Last month, the Guyana Public Service Union (GPSU) condemned government for what was described as an uncaring and unkind approach to the matter. “Cabinet agreed that the Ministry of Education’s proposal to the Ministry of Finance in its budget presentation for 2018 would be used as the basis upon which the other agencies such as the Ministry of the Presidency, the Ministry of Social Protection and the Ministry of Finance will examine carefully the issues in relation to the sweeper-cleaners,” Harmon said. GPSU had said in a press statement in August that the conditions of the sweepers/cleaners continued to deteriorate under the current administration. The sweepers/cleaners are employed by the Ministry of Education to maintain a clean and healthy environment in the public schools. However, the union noted that they were recently informed by head teachers that their work hours would be reduced to six hours daily, although they often require over eight hours to complete their duties. They were also told that would only be paid for two weeks in July and one week in August. The GPSU has sought to have the sweepers/cleaners regularised and for their salaries to be brought in line with the minimum wage of the public service. According to the GPSU, after ardent representation, Cabinet under the former PPP/C administration made a decision on November 5, 2013, that the wages of the sweepers/cleaners would be set in accordance with the Minimum Wages Order [which at the time was $35,000/ month], that sweepers would be employed in all regions and that supplementary provisions would be sought to meet the expenditure retroactive to July, 2013. However, the Cabinet Decision was never implemented, despite it being raised again with the previous administration by the GPSU. President David Granger, while in opposition, supported the call for the workers to be upgraded, the GPSU statement added. When the matter was raised with Granger on August 31, 2015, he referred it the then Minister of Social Protection Volda Lawrence. At the request of the Junior Minister of Finance, the union prepared a detailed statement of the plight of the sweepers/cleaners and forwarded it to him on December 15, 2015. The communique informed of the status of the employees to be upgraded; that [they] be employed on the Permanent Establishment; that they must be paid in keeping with the Public Service Minimum Wage [now $50,000/ month]; that they must be paid the difference in salary with effect from the introduction of the minimum wage from July 01, 2013; that they must be granted annual leave retroactive to at least two years; that National Insurance Scheme contributions must be paid for them; and that their years of service must be taken into [account] from the date of employment since their services were continuous.